On the same October day that Matt Terrones moves across the country from San Diego to Philadelphia, he plays a solo set as Neutral Shirt alongside free cake for every creature and Hello Shark. About twenty people sit on the grass of Clark Park in the “dog bowl,” a massive ditch where West Philadelphians bring their dogs to romp around. Coincidentally, this is the perfect environment for Neutral Shirt to perform – Terrones’ music is best enjoyed on a cool day at the park over the sound of dogs rustling around in autumn leaves. It’s a calming atmosphere, comfortable despite the timidity of entering a new place with new people. After he performs in Clark Park, Matt hands out homemade demo CDs to new friends, each CD envelope individually decorated with pink and purple markers. Again, the presentation fits – Neutral Shirt is a back-and-forth conversation between Terrones and the listener, not so much an anonymous shout into the void. On “Alone Today,” the opening song of his debut EP from Lost Sound Tapes, Terrones reflects on boredom and loneliness, which is ironic, since there’s another singer harmonizing with him through out the track – this kind of subtle, yet thoughtful irony seems to be part of Netural Shirt‘s style. What explanation is there for releasing an EP titled 2016 in 2017 besides doing it for the joke? In just thirteen minutes, 2016 captures a longing for companionship stifled by the fear of leaping into the unknown. On “Sometimes I Just Want to Give Up,” Terrones sings, “I can’t wait to go stay in bed all day/I can’t wait to go outside and play” in between interludes of distorted, yet tropical guitar riffs. This pushing-and-pulling anxiety appears and reappears across the six-song EP – while “Dust On Your Shelf” and “The Last Time” reflect on the loss of a partner, 2016 leaves us with “Best Friend,” the most upbeat, surf-rock inspired song on the EP. With the influence of West Coast DIY bands like Dogbreth, Neutral Shirt mixes the heat and energy of California with the meditative lyricism of East Coasters like Adult Mom. Designed by Lora Mathis, the album cover of 2016 captures a celebratory party scene, but nothing is in the frame except for a lone hat, indicating that someone is gone. 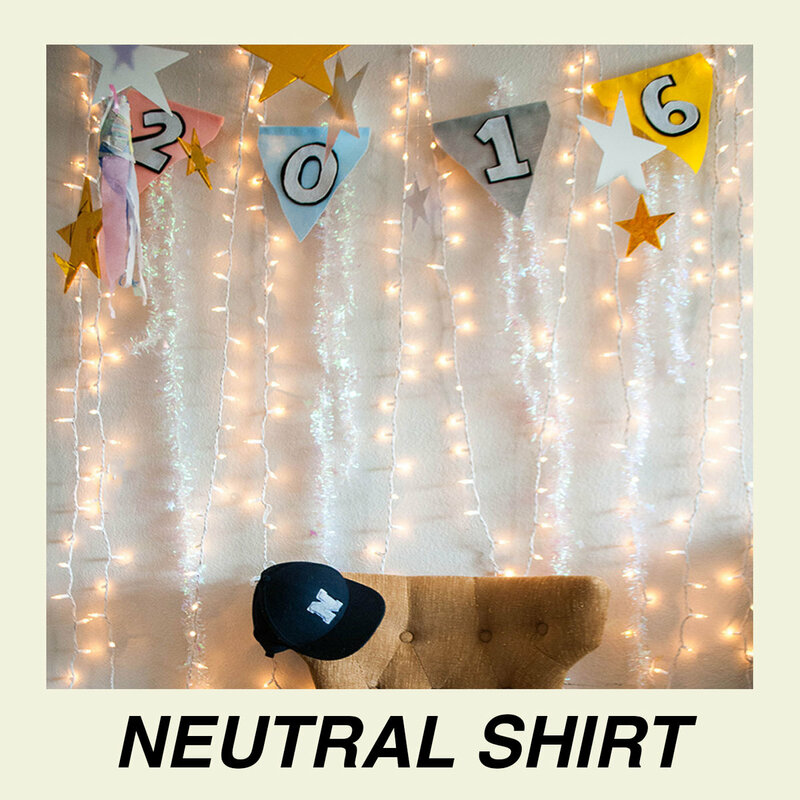 Neutral Shirt is best at existing within this middle ground – the party that fails to be festive, the phone call can come at any second but won’t, and the powerful demo CD hidden inside of a kitschy, Crayola-covered envelope. 2016 is out January 6th. It is available for preorder now.